A catastrophic injury is one that permanently affects an individual’s ability to function properly. It may require extensive medical treatment and ongoing intervention. It may be permanently disabling. It may require an attendant. It may result ultimately in death. What types of injuries are usually classified as catastrophic? In addition, any injury that results in death can be considered catastrophic. How does compensation for catastrophic injuries differ from conventional injury compensation? 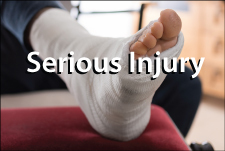 Compensation for serious injuries follows the same rules as conventional injuries: past and future medical expenses, lost wages and reduced earning capacity, disfigurement and permanent physical impairment, and compensation for pain and suffering. The amount is often much greater, however, because of the extent of the injuries. In addition to conventional compensation, some victims demand and receive exemplary, or punitive, damages. These damages are intended to deter future conduct by punishing reckless or malicious negligence. What if the injury was partly my fault? California law allows for partial compensation even when the victim was partly responsible for the injury. Obviously, an experienced attorney is important in such cases. Can catastrophic injury compensation include the death of the injured person? Yes. Some catastrophic injuries lead to death, sometimes months or even years after the injury was inflicted. In such cases, compensation can be expanded to include funeral expenses, loss of companionship and loss of service. This list of serious injury FAQ includes the most basic questions people ask about catastrophic accident injuries. We invite you to talk to our attorneys about your specific case questions. Call Chambers & Noronha in Santa Ana at 714-558-1400. Or ask our lawyers your questions by email.